Encrypt by drag and drop. Now everyone can secure files in the cloud and on local storage devices. Browse, copy, manage your encrypted files and folders using our encryption GUI for the world’s most advanced cryptographic filesystem. Ever lost a USB key? Eliminate the stress and worry of business or personal information falling into the wrong hands by encrypting all data on your portable devices. If you value privacy, storing your sensitive data unencrypted on someone else’s computer network is a grave mistake. Now you have a clear solution. 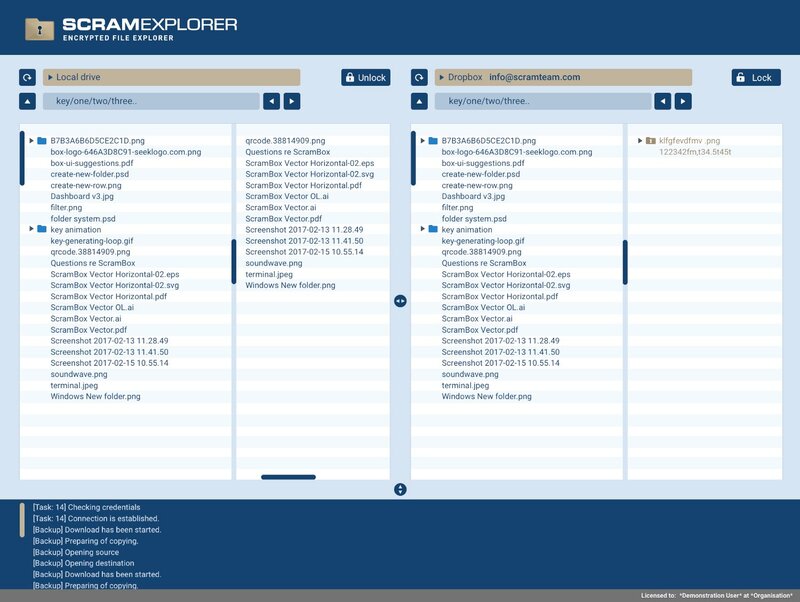 Modelled off Windows File Explorer and Mac Finder, ScramExplorer allows you to browse filesystems, whether they are local or remote, encrypted or unencrypted. Easily connect to both local and cloud storage. Copy your files by dragging and dropping from one pane to the other. ScramExplorer can do what other FTP clients can do, but with encryption and support for modern cloud storage services. It’s a great replacement for FileZilla. Cloud storage is great in so many ways – a virtually limitless supply of storage for you to backup and archive your data. And it’s tempting to archive your personal and business documents there – tax returns, work, photos and videos. But did you know that many cloud services will actually read your data to learn about you? Not to mention the constant attacks from hackers or accidental data leaks caused by careless employees. ScramExplorer allows you to copy your files across to the cloud, but every file is encrypted before it leaves your computer. It allows you to take advantage of the limitless cheap storage and “always on” nature of the cloud while avoiding the privacy drawbacks. Want to share your files with people in different places? Collaborate with others? Simply set up an encrypted directory on your favourite cloud storage, and share the password with others. Now you’ve created a private workspace for sharing and collaboration – only the people with the key can read and write to that space. The simplest form of backup is to copy your data to another place. ScramExplorer makes this easy. And the thing about backups is that the more you have, the safer you are. But if your backups fall into the wrong hands, someone else has your data. ScramExplorer makes it easy to backup your data, securely. You can copy your data to USB disks, Network Attached Storage and to the cloud, all while using encryption to keep your data completely encrypted and unreadable by everyone else.